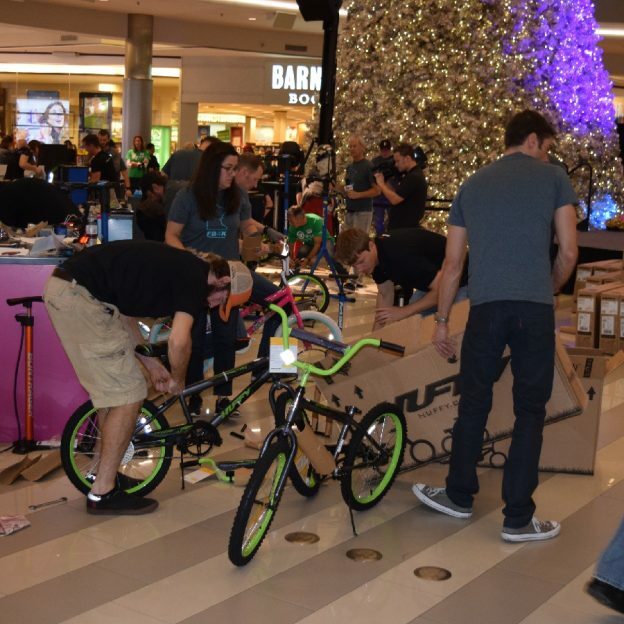 The Free Bikes 4 Kidz Wrench Slinger Shootout 2016 at the Mall of America, this last Sunday afternoon was a tremendous effort, great fun and all teams were winners. The six team there had fun putting together the 150 new kids bikes -they included were: QBP (Quality Bicycle Products), Penn Cycle, Freewheel Bike, Maple Grove Cycling, Tonka Cycle & Ski, and OneTen Cycles. With the bike season changing soon, we hope you get out on your bike and enjoy one or two more fall rides. See all the bike-friendly places to explore in the new Minnesota Bike/Hike Guide. This entry was posted in News and tagged #nextadventure, #nextbikeadventure, #onlyinMN, and OneTen Cycles. #wrenchslinger, Freewheel Bike, Maple Grove Cycling, Minnesota bike shops, Penn Cycle, QBP, Quality Bicycle Products, Tonka Cycle & Ski on November 15, 2016 by Russ Lowthian.